For many years, the Netherlands has had one of the highest road safety levels worldwide, but there are indications that the country is losing ground. Looking at mortality (the number of traffic fatalities per million inhabitants) in the European Union over the period 2009-2011, the Netherlands occupied fourth place with around 40 fatalities per million inhabitants per year. Only Malta, Sweden and the United Kingdom were slightly safer in this respect. However, in 2012 the Netherlands had dropped to sixth place of the EU countries according to a recent report of the the European Transport Safety Council (ETSC). Over the last decade, the developments in the number of fatalities in the Netherlands were less favourable than the average in the other ‘top ten’ EU Member States. This is especially the case for the number of fatalities among cyclists, moped and light moped riders, and passenger car occupants. For motorcyclists, however, the development in the Netherlands was somewhat more favourable. If the population is categorized according to age, the traffic mortality rate in the Netherlands is lower than the average in the other EU Member States for almost all age groups. The rate is only higher in the Netherlands for the ages 12 and 13 and the age group of 67 and over; this is most likely related to bicycle use. In addition to fatalities, a much higher number of traffic injuries occur in traffic; the international attention for the prevention of injuries is increasing. For a long time, the Netherlands performed very well on road safety In comparison with many other countries and was one of the safest countries in Europe and worldwide. However, there are indications that the Netherlands is losing this good position. This fact sheet compares the Netherlands with other European Union (EU) countries and a range of other European and non-European countries by a number of measures of road safety. This fact sheet discusses, in this order, mortality rate, fatality rate, development of the number of fatalities over the years, the European road safety target, development of the number of fatalities for various transport modes and traffic mortality rate for different age groups. Road injuries will also be discussed briefly. For a more thorough analysis of international road safety trends in various parts of the world, we refer to the seventh ETSC PIN report Back on track to reach the EU 2020 Road Safety Target? , the IRTAD annual report 2013  and the World Health Organization’s Global status report on road safety . It must be borne in mind that it is often difficult to compare the road safety data of different countries. In order to compare countries, numbers of crashes or fatalities must for example be related to a country’s population or to distances travelled. Moreover, when interpreting such data, gaps in information and differences in definitions of, for example, crashes, fatalities, severities of injury and road types must always be taken into account. For the Netherlands, this fact sheet uses the real number of fatalities based on the data by Statistics Netherlands (CBS). Not all these fatalities were registered by the police. For other countries this fact sheet presents the registered number, but most countries assume that this is almost equal to the real number. Documentation on the definitions is available, thus making comparison possible in broad terms. Numerous initiatives have recently been developed to improve the quality and comparability of data. For further information on the subject, please see the archived SWOV Fact sheet International comparability of road safety data. Mortality: what is the position of the Netherlands in an international perspective? To compare road safety in different countries, the so-called mortality rate is often used: the number of fatalities per inhabitant. Figure 1 presents the average mortality of the three most recent years (mostly 2009-2011) for the 27 EU Member States, and the average of these countries (EU 27). The data for a number of other, non-EU countries are shown for purposes of comparison. By this measure, the Netherlands occupies fourth place in the EU with around 40 fatalities per million inhabitants; only Malta, Sweden and the United Kingdom have been performing slightly better with slightly above 30 road fatalities per million inhabitants annually. The European non-EU countries Iceland, Norway and Switzerland are on a similar level compared to the Netherlands. Outside Europe, Israel and Japan have similar mortality rates due to road crashes. Figure 1. Number of fatalities per million inhabitants (mortality rate) in different European and non-European countries. 2009-2011 average (* 2008-2009). Source: ; ; . In the period 2009-2011 the Netherlands still takes fourth position. However, a recent ETSC analysis  shows that in 2012 the Netherlands has dropped to eighth position (sixth if we do not take the non-EU countries Norway and Israel into account, as in Figure 1). This is shown by the dark bars in Figure 2. Although of course the data shows only one year, which causes some chance fluctuations, this is still worth considering. Figure 2 also shows the considerable decrease in mortality in Europe over the past decade, and it shows that the Netherlands is one of the countries in which this decrease did not continue after 2010. Figure 2. Number of fatalities per million inhabitants in 31 European countries in 2001, 2010 and 2012 . * Estimate for 2012. Level of risk: how does the Netherlands rank in international perspective? The mortality rate does not take the quantity of traffic, motorized or otherwise, in a country into account. To an extent, dissimilarities between countries can therefore be caused by differences in the degree of motorization and/or mobility. The risk, here defined as the number of fatalities per motor vehicle kilometre, does take this into account. Unfortunately, only a limited number of countries have reliable data on the annual distance travelled. Figure 3 shows the risk in IRTAD countries for which this data was available. Among these are twelve EU Member States, of which Sweden has the lowest number of fatalities per motor vehicle kilometre, followed directly by the United Kingdom and Ireland. The Netherlands occupy the fourth position with around five fatalities per billion motor vehicle kilometres. Figure 3. Number of fatalities per billion motor vehicle kilometres in European and non-European countries (2009-2011 average: * 2008-2010 average). Source: . How does the development in the Netherlands compare to other countries? 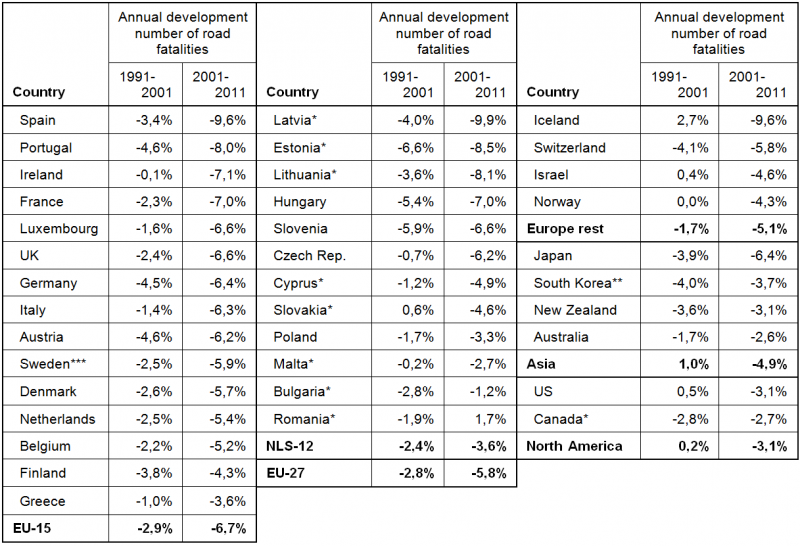 Table 1 shows the average annual development in the number of fatalities in the past two decades: 1991 to 2001 and 2001 to 2011 (sometimes 2010). A distinction is made between the fifteen original EU Member States (EU 15)[i] and the twelve new Member States (NMS 12)[ii] as well as a few other countries or groups of countries. The number of fatalities in the Netherlands decreased annually by an average of 2.5% in the nineties. This rate of decrease is slightly lower than the average of the original fifteen Member States in this period (2.9% rate of decrease) and also slightly lower than that of the EU 27 (2.8% decrease). Also if we look at the past decade, the rate of decrease in the Netherlands (5.4%) is lower than that of the EU 15 average (6.7%) and also slightly lower than that of the EU 27 (5.8%). Spain, Portugal, Ireland and France performed better than the EU 15 average over the past decade. The average annual decrease in the new Member States was 2.4% in the nineties and 6% in the past decade; in both cases (somewhat) lower than in the EU 15. In the past decade, the rate of decrease was higher than the average of the original EU 15 in four of these new Member States, namely Latvia (-9.9%), Estonia (‑8.5%), Lithuania (-8.1%) and Hungary (-7.0%). The average annual decrease in the number of fatalities of Asian countries for which data is available was 4.9% for the past decade; in the United States and Canada this was a 3.1% decrease. Table 1. Average annual trend in the number of fatalities from 1991 to 2001 (** South Korea 1993-2001) and from 2001 to 2011 (* or 2010) in different European and non-European countries (*** Sweden has been correcting for suicides from 2001 onwards: possibly a trend break). Sources: ; ; . Has the Netherlands achieved the first European road safety target? From the beginning of this millennium, the EU has set ambitious targets for road safety. The first target was set in 2001 : its goal was having halved the number of fatalities in Member States by 2010 relative to 2001. An overview by ETSC  indicates that seven countries have achieved this target: Latvia, Estonia, Lithuania, Luxembourg, Sweden, France and Slovenia. In 2012 this number had increased to 15. From 2001 to 2012 the greatest reductions were seen in Latvia (-68%), Spain (-67%), Ireland (-61%) and Denmark (-59%). The Netherlands takes place 28 out of 31 with a reduction of 40%. The goal of the European Union is to again have halved the number of fatalities by 2020 . The target is not compulsory and a number of individual countries, including the Netherlands, have maintained their own road safety targets instead of European ones . How do the modes of transport in the Netherlands relate to those in other countries? It is not possible to provide an accurate picture of the safety of different modes of transport in the Netherlands as compared with those in other countries. The number of casualties per million inhabitants is not a good measure, as it is not corrected for use of the respective modes of transport. In the Netherlands, for example, more cycling is done than in most other countries. Proportionally speaking, per million inhabitants, the Netherlands therefore has more fatalities among cyclists than other European countries. We could obtain a more realistic picture if it were possible to correct for distance travelled with the different modes of transport. However, insufficient data is available internationally for such a comparison. It is possible, however, to consider the relative developments for the different modes of transport, as is done in Table 2. The period 2001-2010 is examined and the Netherlands is compared to the nine other EU Member States that do better than average on road mortality (see Table 1). Looking at Table 2, we can see that the total reduction in the number of road fatalities was smaller in the Netherlands than in the nine other countries. This seems to be caused primarily by the smaller reduction among cyclists in the Netherlands; to a lesser extent the same is true for moped and light moped riders and for passenger cars. For motorcyclists, on the other hand, the development in the Netherlands was slightly better than it was in the other Member States. The differences may have to do with developments in the crash rate of the different modes of transport, or with developments in the mobility of those modes of transport, or with a combination of those factors. Table 2. 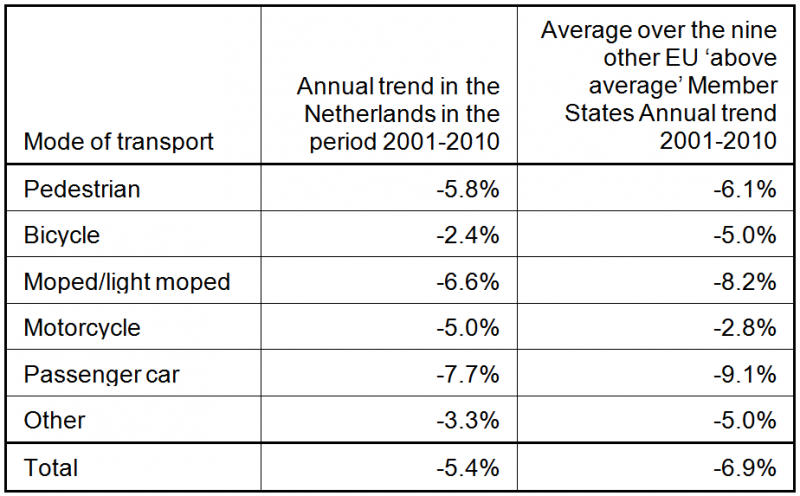 Average annual trend in the number of fatalities for different modes of transport between 2001 and 2010 in the Netherlands and in the nine other countries that perform better than the EU average (Denmark, Finland, France, Germany, Ireland, Malta, Spain, Sweden, and United Kingdom; see Figure 1). Sources: ; . How does the distribution of fatalities according to age in the Netherlands relate to that in other countries? Figure 4 shows the mortality according to age for the Netherlands (2010-2012 average) and for the other nine EU countries in the ‘top ten’ of road mortality (see Figure 1). Figure 4. Number of fatalities according to the age of the casualty per million inhabitants of that age. The Netherlands (2010-2012 average) as compared with the other nine EU countries above the EU average in 2011 (Denmark, Finland, France, Germany, Ireland, Malta, Spain, Sweden, and United Kingdom; see Figure 1). Sources: ;  Dutch data: Statistics Netherlands and the Dutch Ministry of Infrastructure and the Environment. 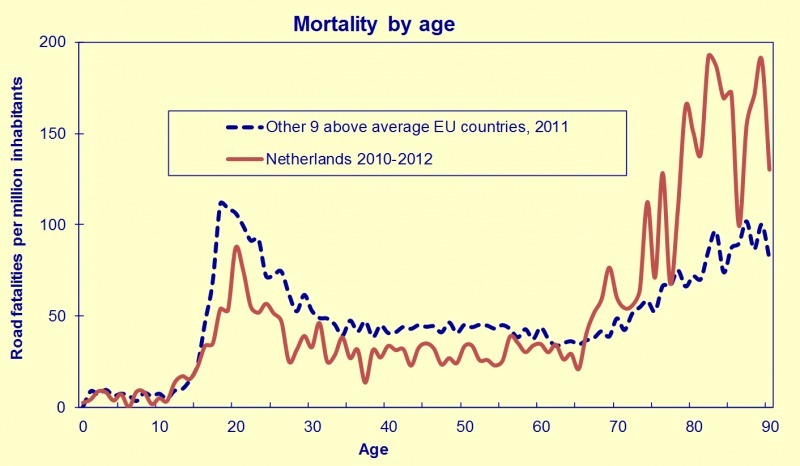 The mortality in the Netherlands is lower than in other countries for almost all age groups. Road safety performance in the Netherlands is worse than the average in the other EU countries only for the ages 12 and13 and for the 67 and over age group. This probably can be explained by the degree of bicycle mobility. Certainly with respect to these age groups, bicycle mobility is higher in the Netherlands than in other countries, and, compared to motor vehicles, bicycle mobility has a higher crash rate. What about the road injuries? So far, road fatalities have been discussed, but the number of serious injuries is a big problem as well. This is not only true for the Netherlands , but also for various other European countries . The European Commission  shows a number of 1.4 million road injuries in the EU 27 in the year 2009. We cannot say how realistic this image is and neither can we compare different countries or name the developments over the years in this respect. One of the reasons behind this is that the definitions of (serious) injuries that are used, are incomparable. Another reason is that in many countries, the registration of road injuries is far from complete. In the EU plans for 2010-2020  reducing the number of road injuries is now seen as an important issue, and at present various developments are taking place in order to achieve this. One step towards better international harmonization is the report of the International Traffic Safety Data and Analysis Group  which includes an extensive overview of how IRTAD countries handle the registration of road injuries and of the definitions that are used. Through ten clear recommendations, the report provides direction for the desired harmonization. At this moment the High Level Group on Road Safety of the European Commission is discussing a common definition (most likely MAIS3+[i]) and a time frame towards the first series of EU-wide data (possibly 2015). [i] MAIS refers to the Maximum Abbreviated Injury Scale, and is a measure used in the international medical world to describe the level of injury, from 1 (light injury) to 6 (fatal injury). The level of road safety in the Netherlands has been one of the highest worldwide for many years now and the country occupies fourth place in terms of the number of fatalities per inhabitant in the European Union for the period 2009-2011. Only Malta, Sweden and the United Kingdom are slightly safer. Within Europe, the level of road safety is also high in Iceland, Switzerland and Norway. However, there are indications that the Netherlands is losing its position in this road safety league. Looking at the 2012 data we must conclude that the EU countries Denmark and Ireland have overtaken us in this respect. In addition, the development in the number of fatalities in the Netherlands has been less favourable than the EU average over the last decade and the decade before that. In comparison with the other well-performing Member States, the development in the number of fatalities among motorcyclists was slightly better in the Netherlands; yet the development in the number of fatalities among cyclists, moped and light moped riders, and car occupants was less favourable. If the population is categorized according to age, the mortality rate in the Netherlands is lower than the average in the other well-performing Member States for almost all age groups. The rate is only higher in the Netherlands for the ages 12 and 13 and 67 and over age groups. This is most likely related to the high level of bicycle mobility of these age groups in the Netherlands compared to other countries. At the moment, a clear picture of the number of (non-fatal) road injuries does not exist in Europe, due to differences in definition and registration of road injuries between the countries. Various international initiatives are working to better harmonize these definitions and methods of registration. SWOV (2013). Dutch road safety in international perspective. SWOV Fact sheet, August 2013. SWOV, Leidschendam.